The New England Patriots are a professional American football team based in the Greater Boston region. 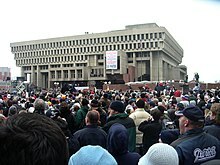 The Patriots compete in the National Football League as a member of the American Football Conference East division. The team plays its home games at Gillette Stadium in the town of Foxborough, Massachusetts, which is located 21 miles southwest of downtown Boston and 20 miles northeast of downtown Providence, Rhode Island. The Patriots are also headquartered at Gillette Stadium. The New England Patriots are a professional American football team based in the Greater Boston region. The Patriots compete in the National Football League (NFL) as a member of the American Football Conference (AFC) East division. The team plays its home games at Gillette Stadium in the town of Foxborough, Massachusetts, which is located 21 miles (34 km) southwest of downtown Boston and 20 miles (32 km) northeast of downtown Providence, Rhode Island. The Patriots are also headquartered at Gillette Stadium. The Patriots have appeared in the Super Bowl eight times in franchise history, six of them since the arrival of head coach Bill Belichick and quarterback Tom Brady in 2000. The Patriots have since become one of the most successful teams in NFL history, winning 14 AFC East titles in 16 seasons since 2001, without a losing season in that period. The Patriots have since set numerous notable records, including most wins in a ten-year period (126, in 2003–2012), an undefeated 16-game regular season in 2007, the longest winning streak consisting of regular season and playoff games in NFL history (a 21-game streak from October 2003 to October 2004), and the most consecutive division titles won by a team in NFL history (won eight straight division titles from 2009 to 2016). The Patriots in 2016 also became the first team originating in the American Football League to reach 500 career franchise wins. The Patriots own the record for most Super Bowls reached by a head coach-quarterback tandem (six), as well as being the first tandem to win the Super Bowl 13 years after the first. Mike Blewitt, Joe Lisi, and Rich Cirminiello break down who the New England Patriots should select with the 32nd overall pick in the 2019 NFL Draft.